Faitron is delighted to introduce BabyBoo, the first electric warming baby bottle. It is fully controlled by app and warms up milk evenly in less than 4 minutes. Due to Faitron’s game changing heating technology, BabyBoo uses 10 times less energy than the current market leader of Fast Baby Bottle Warmer. Through BabyBoo, Faitron is breaking current consumer behavior patterns for baby bottle warming processes by reducing it down to 3 simple steps. First, connect to your smartphone via Bluetooth. Second use the app to set your customized heating process and thirdly feed your baby milk at the most natural and healthy temperature. After HeatsBox, the world’s fastest heating lunchbox, Faitron started developing its second product in December 2016 and already has several fully working prototypes. 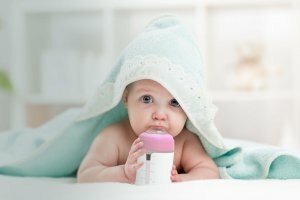 BabyBoo is easy-to-use, lightweight and connects to your smartphone, allowing you to warm the milk directly inside the bottle, no matter where you are, with the touch of a button. With a little bit of power, BabyBoo is ready to be used. It doesn’t matter where you are – in the park or in bed – you can directly start the warming process from your smartphone. The complimentary app allows you to set and control the precise temperature of the milk. Consumers can even track the milk temperature as it warms up and get notified when your perfect bottle is ready. The app also enables parents to directly purchase infant formula, or other baby products through the in-app store. BabyBoo simplifies on the go feeding as it comes with an external battery pack but can also be plugged into the 12V socket in your car. At home, especially for night feeding. BabyBoo is always ready to be warmed through the continuous power supply of the docking station. Providing even more convenience, Faitron offers a UV-lid for sterilizing the inside of the bottle or tap water. The UV light kills 99.99% of germs within 60 seconds and allows you to sterilize the bottle or water anywhere you want. BabyBoo offers sterilizing, warming and feeding, all in one bottle, which makes it the most flexible and first smart-warming baby bottle available. Faitron Ltd. is a Swiss company in the B2B business focusing on innovative mobile food solutions. Our goal is to improve health and well-being through our innovative consumer products. Faitron has won the prestigious 2016 Swiss Kickstart Accelerator program, the largest accelerator in Europe.